This Beautiful Traditional Custom Build Home is Nestled In One of Rossmoors Most Prestigious Locations. A Super Quiet Location at the Top of a Cul-de-Sac Offers A Beautiful View from the Front of the Home. The Home Features a Spectacular 2 Story Formal Entry with Circular Stairs and Formal Living Room and Large Formal Dining Room. A Large Family Room with Vaulted Ceiling and Lots of Windows Face the Backyard and is Open to the Kitchen Creating a Fabulous Great Room Effect Wonderful for Entertaining Large Gatherings. The Kitchen Features a Large Island and Large Walk in Pantry. Immediately Off the Kitchen Is a Cozy Breakfast Room with Lots of Light Coming in From Backyard Patio Doors and Windows. A Downstairs Bedroom or Home Office is Conveniently Located Off of the Entry. The Master Bedroom Is Generously Sized and a Large Master Bath is Near Brand New and Features A Large Shower, Tub and Double Vanity, and a Walk in Closet. Two Additional Large Bedrooms Include a Jack and Jill Bathroom as Well as Walk in Closets. An Open Room Between the Bedrooms is Perfect for TV, Play Area, Study or Office. The Backyard Is Beautifully Landscaped and Has Lots of Patio Area Surrounding A Stunning Pool and Spa. A Built in BBQ and Outdoor Dining Area Make for an Entertainers Dream Backyard. The Oversized 8,640 Sq. Ft. Lot Allows for a Huge Backyard. 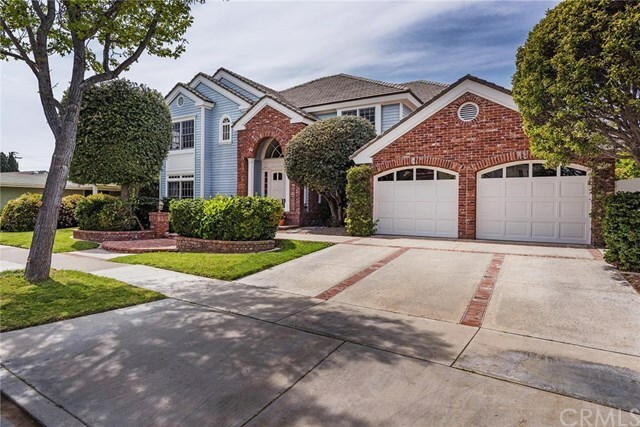 This is Truly a Special House in a Special Location in Rossmoor.